With 2011 underway, here's some material to help pack a punch in our upcoming presentations. Answering this may be the most complicated task in making a presentation but warrants our attention. In Made to Stick, we call this concept, "Simple." What is the one point that we want our audience to retain from our presentation? This week, there is a presentation on honesty in kishore/kishori sabha. It seems simple enough to honestly come up with a simple message for a presentation on honesy; however we would be lying if we said it really was not complicated. Here are some ideas to help us start off on the right foot. Honesty takes courage, and being honest with oneself takes the most courage. Swamishri gives us the courage to be honest to ourselves and others. Honesty is about being in the shining light in the world of darkness, and we can look to Swamishri for illumination. Dishonesty is the path of the drama queen - not the path endorsed by Swamishri. Starting off a talk with something unexpected is all about creating curiosity. When we get the audience wondering, "Why did you say that? What are you going to say next?" we get their permission to have their attention. So in this case, if we want to show the positives of honesty, we can start off with something that seemingly demonstrates the negatives of honesty (though upon further examination it may not) or something that seems totally irrelevant to honesty. One example is to start off with Chattooga County, Georgia, from an episode of This American Life where a local newspaper column caused a lot of controversy when it allowed people to share their honest opinion. (Listen to 22:30-30:00). Honesty... causing drama? That's the opposite of what I'd expect to hear in sabha! And thus you've set the bait for the presentation. NOTE: Of course, we'll need to come around sometime and explain that while the people were honest, they were not courageous given their anonymity. Following up with some stories hammers that point home, namely ones that have juicy details (concrete) and are authentic in nature (credible). This is Made to Stick 101. So this week we have a presentation on honesty. How can we pique our audience's curiosity? Here are some suggestions to get started though we'd love to hear any other original ideas. Facebook drama. It happens every day. Someone says something on your wall, another peson say something else, you have to clarify what is true and what is not true. In fact, some people have taken to deactivating their account when they are not on-line, and then reactivating their account when they pop back on-line. What would it be like if there was no drama, you never had to worry about what someone was putting on your wall while you were not paying attention. 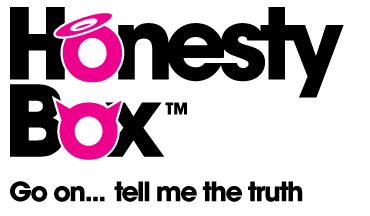 Someone had this idea and created the Honesty Box app (or plug-in or some such - as you can tell I don't have a FB account). This honesty box lets other people anonymously say the truth on your wall. Do you think this type of honesty increased or decreased the drama? Marketers are liars. That is their job and they are very good at it; how else do they sell their stuff? Watch a small clip from this video about the new version of Shreddies cereal. [The following clip is worth watching, however the three minutes from 11:40 to 14:40 really hits the mark]. As always, please let us know how this material helped. Honestly, we mean it.